For other uses, see Kahuna (disambiguation). Kahuna is a Hawaiian word, defined as a respectful man who has moral authority in society "a prime person, a minister, or an expert in any profession". A kahuna may be versed in agriculture, canoe building or any other talent. Blessing new buildings and construction projects, officiating weddings are some of the tasks a kahuna may be called upon to perform, by his or her community. Forty types of kahuna are listed in the book Tales from the Night Rainbow, twenty in the healing professions alone, including "Kahuna lapaʻau, medical priest or practitioner", and "Kahuna hāhā, an expert who diagnoses, as sickness or pain, by feeling the body". There are two main categories of kahuna; craft kahuna, such as the kālai waʻa - an expert canoe maker, and hoʻokele - an expert navigator; vs sorcery kahuna such as kahuna ʻanāʻanā and kahuna lapaʻau (healer). Kuhikuhi puʻuone (literally "to direct divination"): one who locates the site for the construction of heiau, or temples. kilokilo: one who divines and predicts future events, a prophet. Hoʻounāunā: one who can send spirits to cause an illness. ʻAnāʻanā: one who "practices evil sorcery by means of prayer". Nānāuli: one who studies natural signs, like clouds, rains, and winds. Poʻi ʻUhane: one who can catch a spirit and force it to do its bidding. Lapaʻau: one who practices procedures of medicinal healing. Expert kahuna are called Kahuna Nui (High Priest) and Kahuna Nui lived in places such as Waimea Valley, which is known as the "Valley of the Priests". They were given slices of land that spanned from the mountain to the sea. Hewahewa, a direct descendant of Paʻao, was the Kahuna Nui to Kamehameha I. A contemporary, Leimomi Mo'okini Lum is a Kahuna Nui. David Kaonohiokala Bray was a well-known kahuna. King Kamehameha IV, in his translation of the Book of Common Prayer, used the term Kahuna to refer to Anglican priests and Kahunapule to refer to both lay and ordained Anglican ministers. Craft kahuna were never prohibited; however, during the decline of native Hawaiian culture many died out and did not pass on their wisdom to new students. As an example, when the Hōkūle‘a was built to be sailed to the South Pacific to prove the voyaging capabilities of the ancient Hawaiians, master navigator Mau Piailug from Satawal was brought to Hawaii to teach the Hawaiians navigation. It is often said that the missionaries came to Hawaii in 1820 and made kahuna practices illegal. In the 100 years after the missionaries arrived all kahuna practices were legal until 1831, some were illegal until 1863, all were legal until 1887, then some were illegal until 1919. Since 1919, all have been legal, except sorcery, which was illegal at first, but was decriminalized in 1972. The first Christian missionaries arrived in 1820. The most powerful person in the nation, Kaʻahumanu, did not convert until 1825. But it was not until 11 years after missionaries arrived that she proclaimed laws against hula, chant, ‘awa (kava), and Hawaiian religion. The use of the term in reference to surfing can be traced back to the 1959 film Gidget, in which "The Big Kahuna", played by Cliff Robertson, (Martin Milner in the TV episode), was the leader of a group of surfers. The term then became commonplace in Beach Party films of the 1960s such as Beach Blanket Bingo, where the "Big Kahuna" was the best surfer on the beach. Eventually, it was adopted into general surfing culture. Hawaiian surfing master Duke Kahanamoku may have been referred to as the "Big Kahuna" but rejected the term as he knew the original meaning. In the New Age spiritual system known as Huna, which uses some Hawaiian words and concepts appropriated from Hawaiian tradition, kahuna denotes someone of priestly or shamanic standing. The prevalence of these works in pop culture have even come to influence English dictionary definitions such as Merriam-Webster, which now defines kahuna not only as "a preeminent person or thing" but with a secondary definition of "Hawaiian shaman". In the 1999 movie The Big Kahuna salesmen are trying to get a lucrative contract with a manufacturer they refer to as the "great kahuna". In a fantasy scene, Kevin Spacey's character wears a headdress and is revered as "the big kahuna". The term was also used by Wally Amos in his cookie business, The Cookie Kahuna. ^ "Kahuna". Ulukau Hawaiian Electronic Dictionary. Retrieved 27 May 2018. ^ "Waipi'o Valley with Kia Fronda 1992". YouTube. Rusty Wright. Retrieved 31 May 2018. ^ "The Three Kahunas". Kathy Long Artist. Kathy Long. Retrieved 31 May 2018. ^ "David "Daddy" Kaonohiokala Bray" (PDF). US Census. US Census. Retrieved 27 May 2018. ^ a b Ruth-Inge Heinze (1991). Shamans of the 20th Century. Ardent Media. p. 44. ISBN 978-0-8290-2459-3. ^ "Hawaiian Dictionary: Page 46 haʻe - -hahau.hia" (PDF). Ulukau: The Hawaii Electronic Library. Retrieved 28 May 2018. ^ "Ulukau: The Hawaii Electronic Library" (PDF). ulukau.org. Retrieved 28 May 2018. ^ "Page 173 kū.hala.kai - kū.hipa" (PDF). Ulukau: The Hawaii Electronic Library. Retrieved 27 May 2018. ^ "Page 446 fond - founder". Ulukau: The Hawaiian Electronic Library. Retrieved 27 May 2018. ^ "Page 24 āna - ʻana.puʻu". Ulukau: The Hawaiian Electronic Library. Retrieved 27 May 2018. ^ "Page 261 nana.au - nani". Ulukau: The Hawaiian Electronic Library. Retrieved 27 May 2018. ^ E.S. Craighill Handy; Davis (2012-12-21). Ancient Hawaiian Civilization: A Series of Lectures Delivered at THE KAMEHAMEHA SCHOOLS. Tuttle Publishing. pp. 252–. ISBN 978-1-4629-0438-9. ^ "About Laʻau Lapaʻau, and Lapaau.org". lapaau.org. Retrieved 27 May 2018. ^ "Waimea Valley". Hawaii.com. Retrieved 30 May 2018. ^ "History of Waimea Valley". Waimeavalley.net. Retrieved 29 May 2018. ^ "Pa'ao From Thrum, Emerson, and Kamakau". Hawaiian Voyaging Traditions. Retrieved 27 May 2018. ^ "Big Island heiau to host celebration of stewardship". Bizjournal. June 20, 2004. Retrieved 28 May 2018. ^ Perez, Christina; George KO, Brendan (September 22, 2017). "hawaii hokulea canoe polynesian sailing/". Vogue. Retrieved 27 May 2018. ^ Kamakau, Ruling Chiefs, p. 298-301. ^ Serge Kahili King (2014-05-27). Kahuna Healing. Quest Books. p. 38. ISBN 978-0-8356-3107-5. ^ Merriam-Webster. "Kahuna". Merriam-Webster. Retrieved 19 April 2018. ^ Rosen, Steven. "'Kahuna' no more than guys talking". Denver Post. Retrieved 2016-07-22. ^ "The Story". The Cookie Kahuna. Retrieved 1 March 2018. Look up kahuna in Wiktionary, the free dictionary. 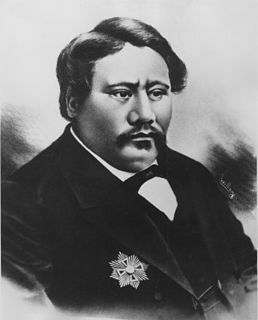 Kamehameha V, born as Lot Kapuāiwa, reigned as the fifth monarch of the Kingdom of Hawaiʻi from 1863 to 1872. His motto was "Onipaʻa": immovable, firm, steadfast or determined; he worked diligently for his people and kingdom and was described as the last great traditional chief. His full Hawaiian name prior to his succession was Lota Kapuāiwa Kalanimakua Aliʻiōlani Kalanikupuapaʻīkalaninui. Kuini Liliha was a High Chiefess (aliʻi) and noblewoman who served the Kingdom of Hawaii as royal governor of Oʻahu island. She administered the island from 1829 to 1831 following the death of her husband Boki. Waimea Valley is an area of historic cultural significance on the North Shore of Oahu, Hawaii. The valley, being an important place in Hawaiian religion, includes several historical structures including stone terraces and walls constructed during the time of the Hawaiian monarchy. The nutrient-rich volcanic soil combined with a rainy environment provided the resourceful Hawaiians of the area the opportunity to create one of the most prosperous farming communities in all of Polynesia. The area had complex fish ponds, domesticated animal pens, various large farming beds, and was famous for the cultivation of pink taro root stock, a coveted item to the Ali`i. Much of the garden floor was once cultivated for taro, sweet potato, and bananas, with new crops and orchards introduced by Europeans after their arrival. Hoʻoponopono is a Hawaiian practice of reconciliation and forgiveness. The Hawaiian word translates into English simply as correction, with the synonyms manage or supervise, and the antonym careless. Similar forgiveness practices are performed on islands throughout the South Pacific, including Hawaii, Samoa, Tahiti and New Zealand. Traditional Hoʻoponopono is practiced by Indigenous Hawaiian healers, often within the extended family by a family member. There is also a New Age practice that goes by the same name. Mary Abigail Kawenaʻulaokalaniahiʻiakaikapoliopelekawahineʻaihonuaināleilehuaapele Wiggin Pukui, known as Kawena, was a Hawaiian scholar, dancer, composer, and educator. Harriet or Harrieta Keōpūolani Nāhiʻenaʻena (1815–1836) was a high-ranking princess during the founding of the Kingdom of Hawaii and the conversion of some of the ruling class to Christianity. Samuel Mānaiakalani Kamakau was a Hawaiian historian and scholar. His work appeared in local newspapers and was later compiled into books, becoming an invaluable resource on the Hawaiian people, Hawaiian culture, and Hawaiian language during a time when they were disappearing. Ulumāheihei Hoapili was a member of the nobility during the formation of the Kingdom of Hawaii. He was a trusted military and political advisor to King Kamehameha I, known as "Kamehameha the Great". Although trusted with one of the last symbolic rites of the Hawaiian religion, he later became a supporter of Christian missionaries. Manono II was a Hawaiian chiefess and member of the royal family during the Kingdom of Hawaii. She along with her second husband Keaoua Kekuaokalani died fighting for the Hawaiian religion after Kamehameha II abolished the kapu system. Peleuli, formally Peleuli-i-Kekela-o-kalani, was a Queen consort of the Kingdom of Hawaii as a wife of king Kamehameha I.